Jules Bastien-Lepage (1848–1884), Love in the Village (1882), oil on canvas, 194 × 180 cm, Pushkin Museum of Fine Arts Музей изобразительных искусств им. А.С. Пушкина, Moscow, Russia. Wikimedia Commons. The Paris Salon of 1883 was very large, with nearly 2,500 paintings on display. Among those emerged a new school of painting – not that of Impressionism, which had remained fiercely independent and even then was hardly popular, but of a new form of realism: Naturalism. For the next couple of decades, it was not Impressionism or even Post-Impressionism which dominated painting in Europe, but Naturalism. In this and subsequent articles in this series, I’m going to try to construct a history of this major movement in its paintings and artists. I start here trying to consider what makes a painting Naturalist. Among the many increasingly loose and colourful landscapes, dozens of portraits, and traditional paintings in that Salon, or painted that year, were some which trod new ground. They are often strikingly realist in their style, but show motifs which went beyond what had previously been considered to be genre. Fernand Pelez (1848-1913), Homeless (1883), oil on canvas, 77.5 x 136 cm, location not known. Image by Bastenbas, via Wikimedia Commons. 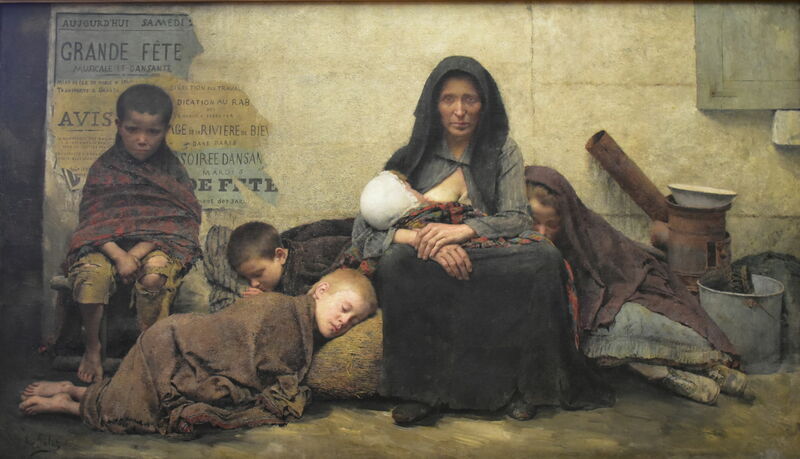 Most surprising for those viewing the Salon that year would have been Fernand Pelez’ painting Homeless (1883), its hard realism showing what many of them went out of their way to avoid on the streets of Paris. Pelez skilfully avoids the sentimentality which had counfounded so much earlier social realism. Neither was this rural poverty, but a vividly real image of what was visible not far from the Salon in the Palais des Champs-Élysées (the Palais de l’Industrie, built for the 1855 World Fair). Jean-Eugène Buland (1852–1926), Le Tripot (The Dive) (1883), oil on canvas, 63.5 × 109.2 cm, location not known. Wikimedia Commons. 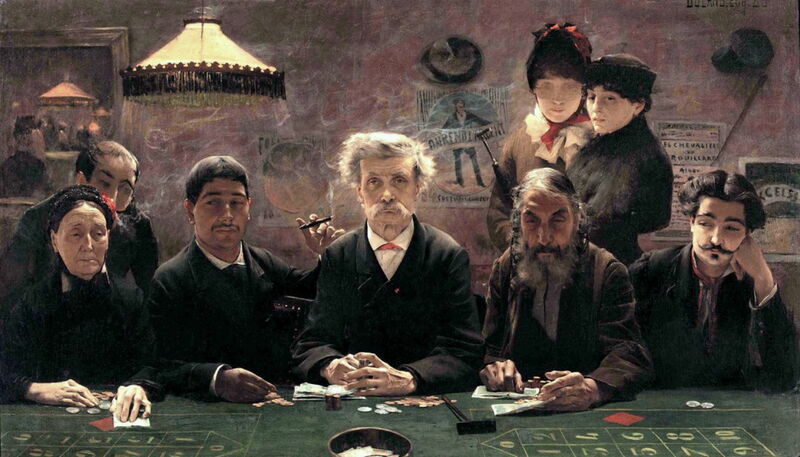 That year, Jean-Eugène Buland exhibited Pas le sou (Not a penny), but his major new painting was one of his finest: Le Tripot (The Dive) (1883), a group portrait of five hardened gamblers at the table of a seedy, downmarket gambling den. 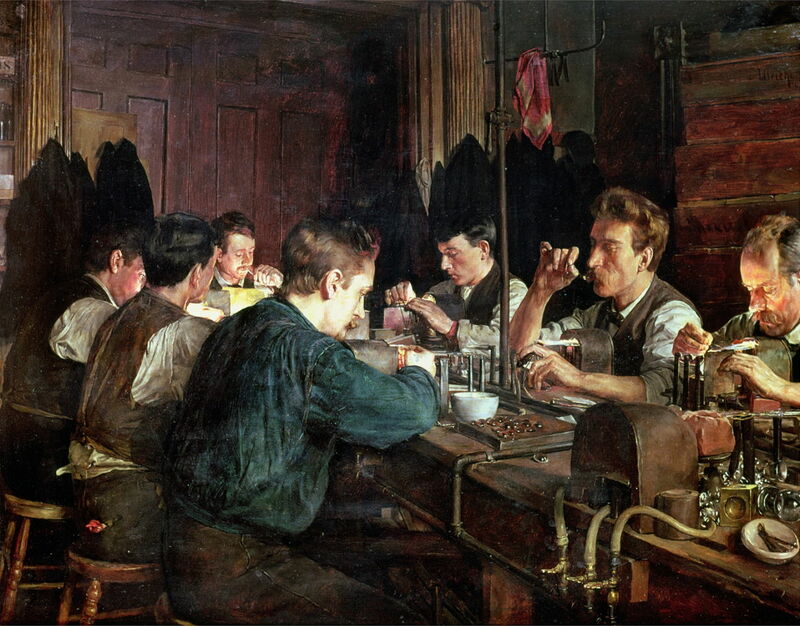 Charles Frederic Ulrich (1858–1908), The Glass Blowers (1883), oil on canvas, 47.8 × 58.4 cm, Museo de Arte de Ponce, Ponce, Puerto Rico. Wikimedia Commons. Several paintings in that Salon showed ordinary people engaged in their everyday work in factories and similar industrial environments. This example, by the American artist Charles Frederic Ulrich, who worked for much of his career in Germany, wasn’t exhibited at the Salon, though. The men here are blowing glass to be made into the covers of watches and clocks. 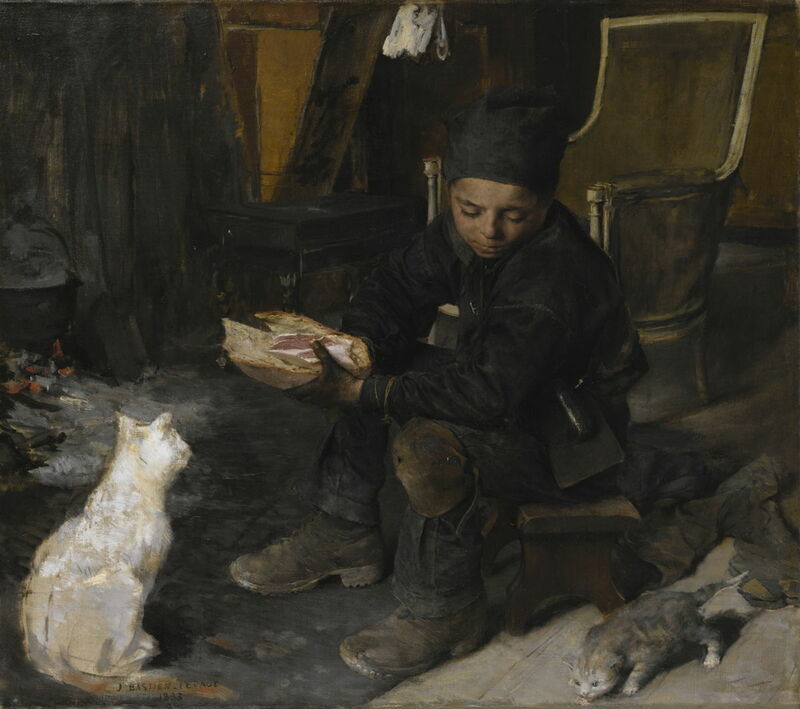 Leading this new movement was a former pupil of Alexandre Cabanel: Jules Bastien-Lepage, who reached his zenith in 1883 before dying prematurely the following year. 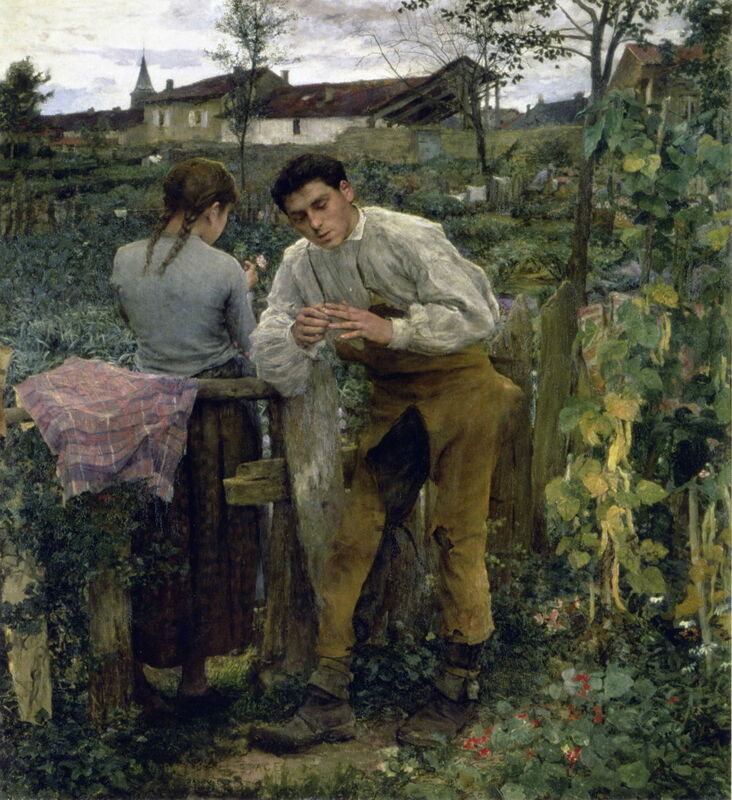 Many of Bastien-Lepage’s paintings of this time are single-figure portraits, mostly of children, but his Love in the Village, which was exhibited at the Salon in 1883, shows a young couple on either side of a tumbledown fence, chatting intimately among the vegetable patches. One early reading, by Mette, the wife of Paul Gauguin, held that the girl was under age, and the relationship accordingly beyond the pale. The girl not only faces away from the viewer, but her whole body is turned away, leaving that issue unresolved and unresolvable. Bastien-Lepage here uses his favourite compositional devices. The horizon is very high, so that almost all of the image is made up of the figures and their landscape background. The foreground has meticulous detail, from the mud on the man’s boots to the plaits in the woman’s hair, but the further than you look into the distance, the more sketchy those details become. Jules Bastien-Lepage (1848-1884), The Little Chimneysweep (Damvillers) (1883), oil on canvas, 102 x 116 cm, location not known. Wikimedia Commons. More typical of his portraits is The Little Chimneysweep (Damvillers), one of his last paintings, completed in 1883. This young chimneysweep sitting in his tiny hovel with stray cat and kitten has the air of authenticity. The hand grasping that slab of bread is still black with soot. Bastien-Lepage’s brilliant protégé Marie Bashkirtseff showed two works in that Salon, Jean et Jacques and Parisienne, which I have been unable to identify or locate. Marie Bashkirtseff (1858–1884), The Umbrella (1883), oil on canvas, 93 × 74 cm, State Russian Museum, Saint Petersburg. Wikimedia Commons. 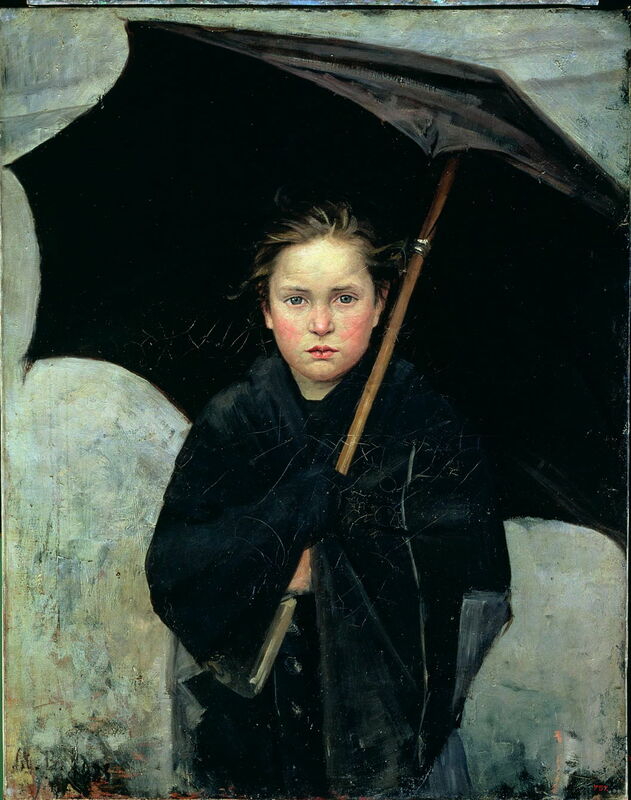 Bashkirtseff’s The Umbrella was painted that year, 1883, and shows her take on Naturalism. Tragically, she was to die the following year, less than two months before Bastien-Lepage, at the age of only twenty-five. Though a young movement in painting, Naturalism had originated in literature during the 1860s, and was being expressed most clearly in the novels of Émile Zola from 1871 onwards. It had already reached the Nordic countries by 1883, where it was embraced by the Norwegian painter Christian Krohg. Christian Krohg (1852–1925), Mother and Child (1883), oil on canvas, 53 x 48 cm, Nasjonalgalleriet, Oslo, Norway. Wikimedia Commons. 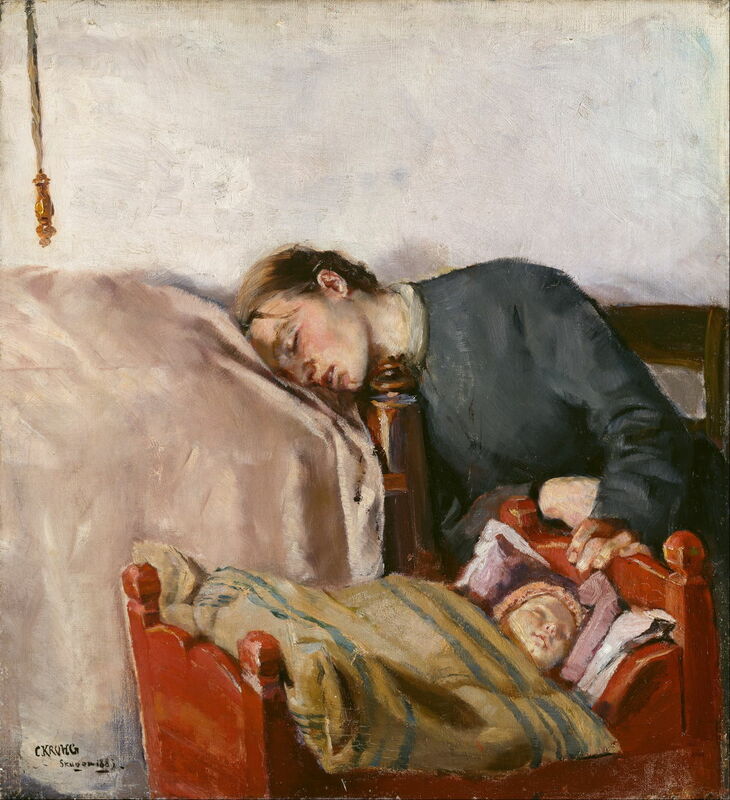 Krohg became fascinated by the exhausted mother of a sick child, as shown in his Mother and Child from 1883. As with other works of his from around this time, the figures are shown in a barren, almost clinical setting to enhance the impression of objectivity, and avoid any tendency to sentiment. Christian Krohg (1852–1925), Madeleine (1883), oil on board, 53 x 45 cm, Lillehammer Art Museum, Lillehammer, Norway. The Athenaeum. Krohg’s particular social concern was for the ‘fallen woman’ and the scourge of prostitution. 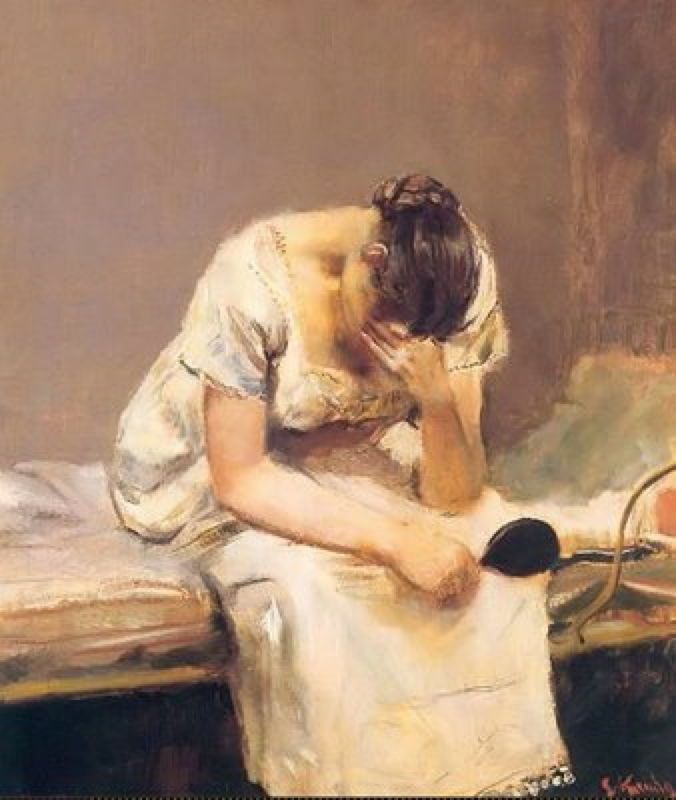 In 1883, he painted Madeleine, the first of a long series of works addressing this. sometimes being ‘photographic’ in quality. Naturalism didn’t dominate the 1883 Salon, but the Naturalist works exhibited there attracted the attention of both the public and the critics. Other paintings of note which were popular that year included the following. Virginie Demont-Breton (1859–1935), The Beach (1883), oil on canvas, 190 x 348 cm, Musée des Beaux-Arts d’Arras, Arras, France. Wikimedia Commons. 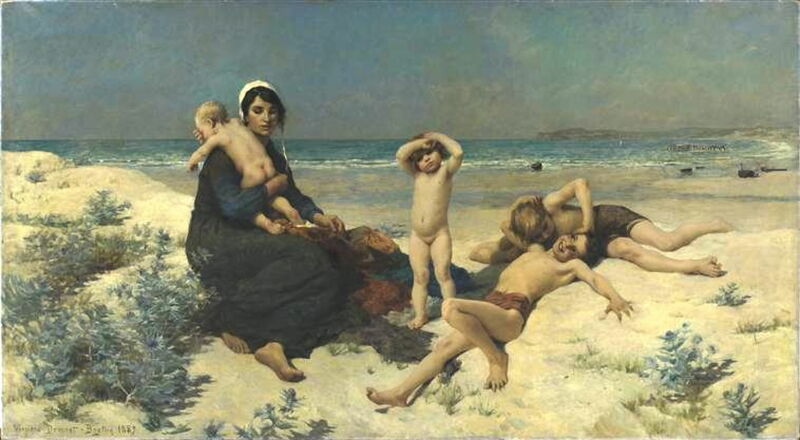 Virginie Demont-Breton’s The Beach (1883) earned her ‘hors-concours’, and was purchased by the state. Georges Rochegrosse (1859–1938), Andromache (1883), oil on canvas, 884 x 479 cm, Musée des Beaux-arts, Rouen, France. Wikimedia Commons. 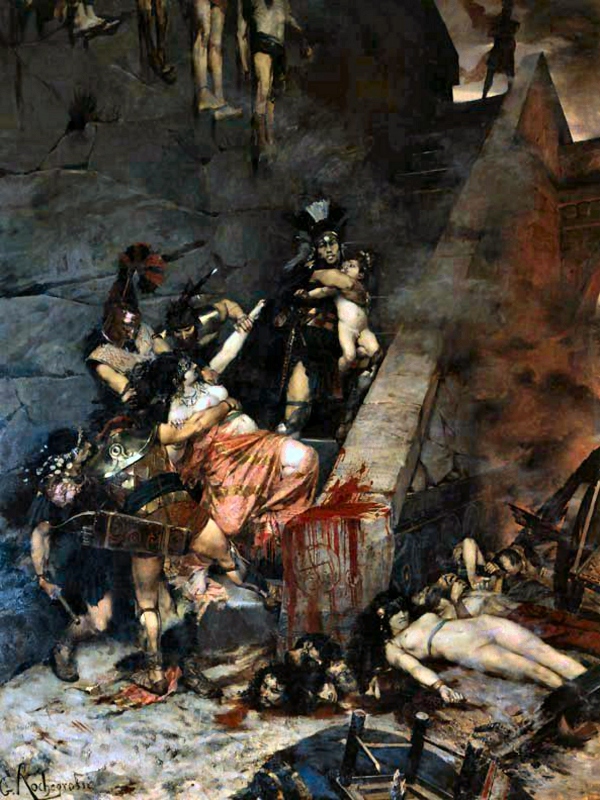 Georges Rochegrosse’s huge and gruesome painting nearly nine metres high of Andromache shows a spectacularly-imaged scene from the sack of Troy. Andromache is at the centre, being restrained by four Greeks prior to her adbuction by Neoptolemus. Her left arm points further up the steps, to a Greek warrior in black armour holding the infant Astyanax, as he takes him up to the top (where another Greek is shown in silhouette) to murder him. There is death and desolation around the foot of the steps: a small pile of severed heads and jumble of living and dead. Jean-Joseph Weerts (1846–1927). The Death of Barra (1880), oil on canvas, 350 x 250 cm, Musée d’Orsay, Paris. Wikimedia Commons. 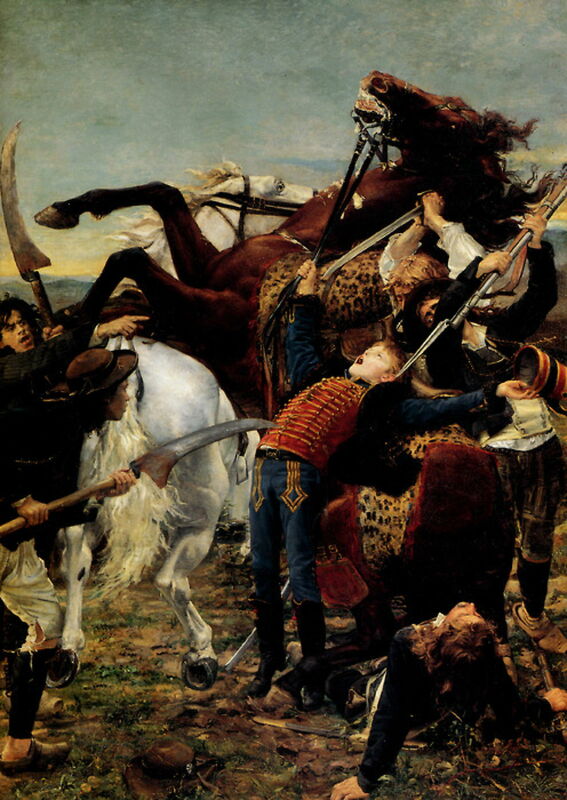 Jean-Joseph Weerts’ The Death of Barra (1880) is another large history painting with calculated popular appeal. It shows a romanticised story which had started with a young boy who was killed by a gang of horse thieves during the uprising in the Vendée in 1793 – one of the French nation’s less glorious moments. During the French Revolution, this was turned into propaganda by false claims that the boy had been killed because he had stood up for the French Republican movement against the Royalists. Weerts has embroidered this further. Alexandre Cabanel (1823–1889), Ophelia (1883), oil on canvas, 77 x 117.5 cm, Private collection. Wikimedia Commons. 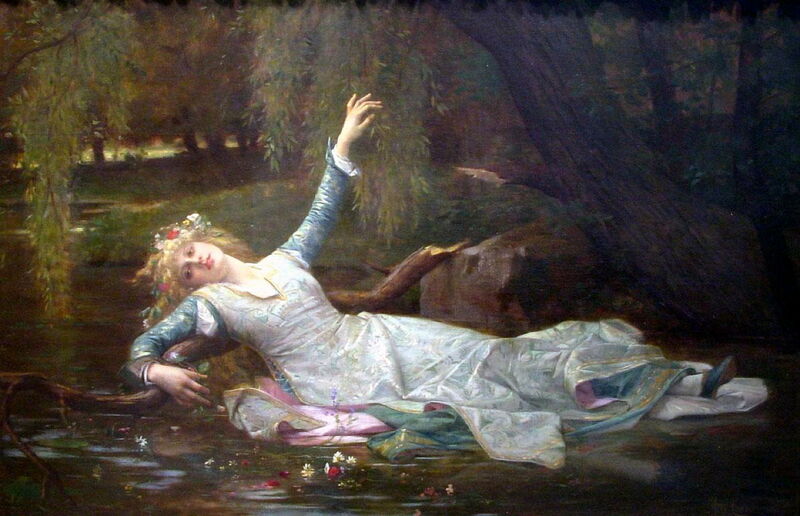 Alexandre Cabanel himself exhibited two portraits in the Salon, but that year painted Ophelia, which was influenced by John Everett Millais’ painting of her from 1851-52. He probably wasn’t aware that his former pupil Bastien-Lepage had started to paint her two years earlier, but that work remained incomplete on his death in 1884. Édouard Debat-Ponsan (1847–1913), The Massage. Hammam Scene (1883), oil on canvas, 127 x 210 cm, Musée des Augustins de Toulouse, Toulouse, France. Wikimedia Commons. Édouard Debat-Ponsan was also known for his Naturalist paintings, but had recently returned from a stay in Istanbul. In a passing Orientalist phase, he exhibited The Massage. Hammam Scene (1883), which proved highly popular. Absent from the Salon was the arch-realist of the century, and another enthusiastic Orientalist, Jean-Léon Gérôme. Jean-Léon Gérôme (1824–1904), The Christian Martyrs’ Last Prayer (1863-83), oil on canvas, 87.9 x 150.1 cm, Walters Art Museum, Baltimore, MD. Wikimedia Commons. 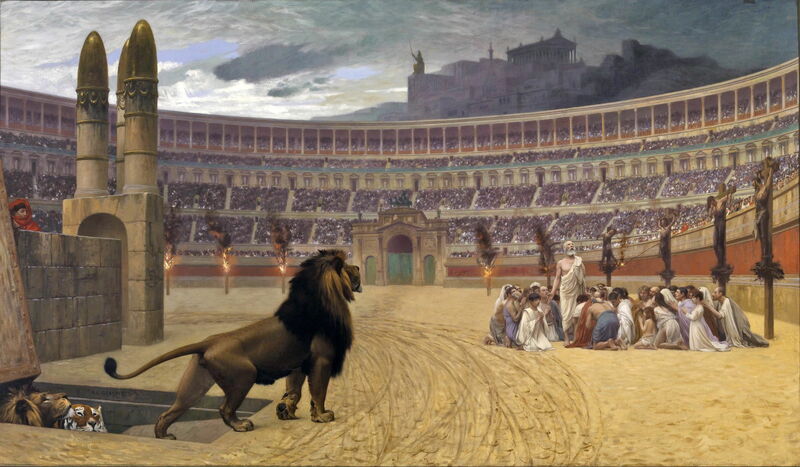 In 1883, Gérôme finally completed The Christian Martyrs’ Last Prayer, which he had started twenty years earlier. It is perhaps one of his least successful classical Roman scenes, containing surprisingly clumsy historical errors. Among them is the fact that this shows the Circus Maximus, where such martyrdoms and crucifixions didn’t take place. I hope that this gives a clearer picture of what was happening as Naturalism was becoming popular. My next task is to identify its roots and origins. Posted in General, Life, Painting and tagged Bashkirtseff, Bastien-Lepage, Buland, Cabanel, Debat-Ponsan, Demont-Breton, Gérôme, history of painting, Krohg, naturalism, painting, Pelez, realism, Rochegrosse, Ulrich. Bookmark the permalink.